When ship movement wound, string-wind musical movement pulled and separate start/stop controls for each actuated, the ship realistically see-saws up and down before the fort under siege, whilst the first of two musical airs ring out. 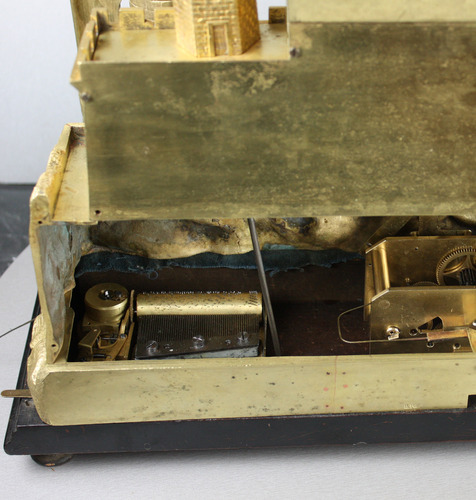 The rocking ship four-pillar movement with single spring barrel drive, tri-pivot camel-back motion cam which transmits action to ship horizontally with start/stop to rear next to winding spindle, mounted on wood soundboard beside the pull-string tabataire cylinder movement, with single-section comb, signed bass lead, snail wheel set to automatic change for 1-2-1-2 sequence, start/stop to right-hand side. The 2-train timepiece striking on a bell, pendulum with silk suspension, circular four-pillar movement with Baullier stamp to backplate, small white enamel dial with slight-domed profile flanking winding holes, black Roman numerals and fine chapter ring, slender spade-tip blued hands. 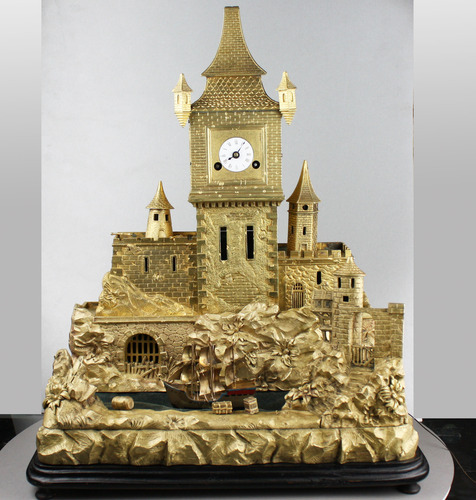 The whole of three-dimensional multi-cast gilt bronze, central clocktower with Mansard roofline with base section corners with twin floating turrets, individual curved and straight tile details all depicted, dental cornice below dial frontage, on part-rendered base with double arrow slits, corner stones, flanked by differing level wings each with battlements, one conical and one hexagonal towers with matching roofs and windows, two cannons await to fire at the enemy to the left with a cannonball at the ready, on rocky base with substantial structure, flora and forna against the rocks, with three sided parapet. The rocking ship on the dark green velvet to resemble water, at full sail, enclosed by bank with rocks at one end and a harbour tower and gated arch at the other, a barrel and two crates left washed up on the bank, on ebonised base with moulded edge, on turned feet. 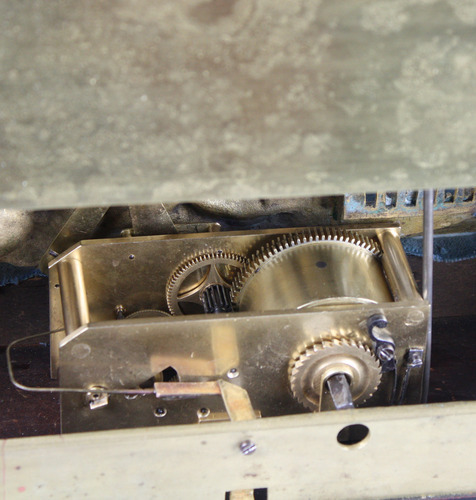 Highly polished movement access panels to rear. 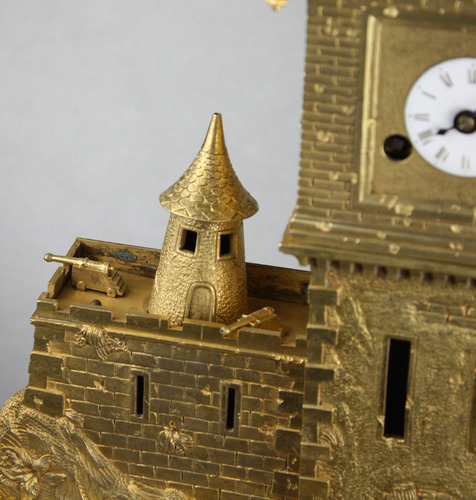 Modelled as being under siege, with lots of pock marks to the fort walls and dial surround. 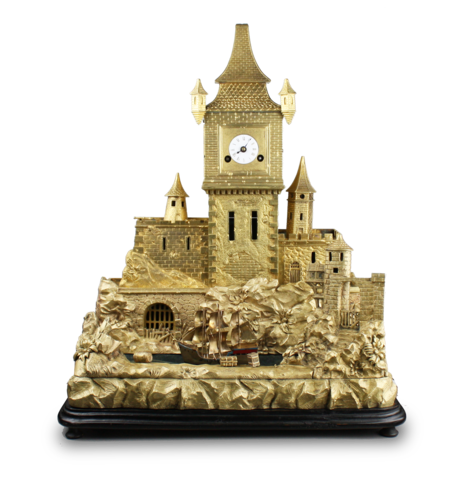 The purpose of the subtle use of two-tone gilding, makes this superb three-dimensional diorama to appear to reach further into the distance. 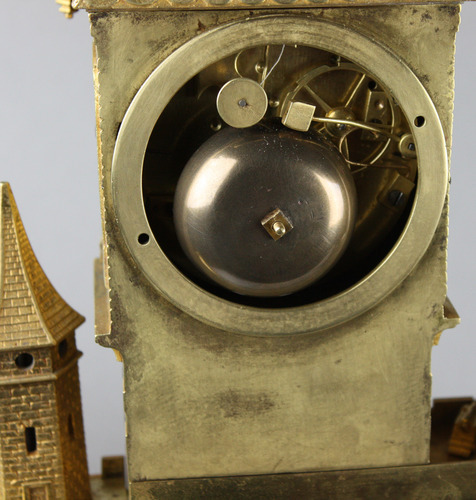 Positioned at just below eye-height, this timepiece automaton works particularly well. Take a good look at the 'damage' which has been deliberately cast into the walls of the tower and battlements. 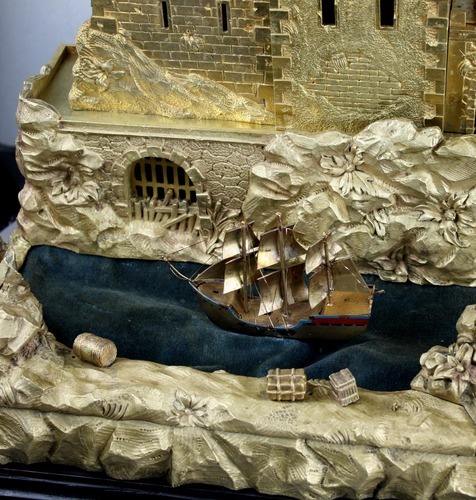 This piece has one of the best rocking ship actions yet seen, housed in one of the most detailed and large casements.